We needed a way to account for significant wind and weather changes during the bike leg on some of the longer courses. Over the past month the BBS team has been developing a new advanced weather feature for premium members. The idea spawned after seeing significant wind changes from the start of the bike to the end on some of the longer courses. No where is this more apparent than at courses close to the coast like Kona, but even courses like Ironman Texas and Arizona can experience pretty large shifts in weather and wind as the race progresses. This new feature creates a forecasted weather map for the course based on both location and time. The athlete or coach simply adds the approximate time the athlete will start the bike and our algorithm goes out and starts to pull forecasted weather information from points along the course corresponding to the time that the athlete will be crossing into those zones. We are very excited about this new powerful feature as it represents a very important building block for us to develop even more exciting innovations in the future. 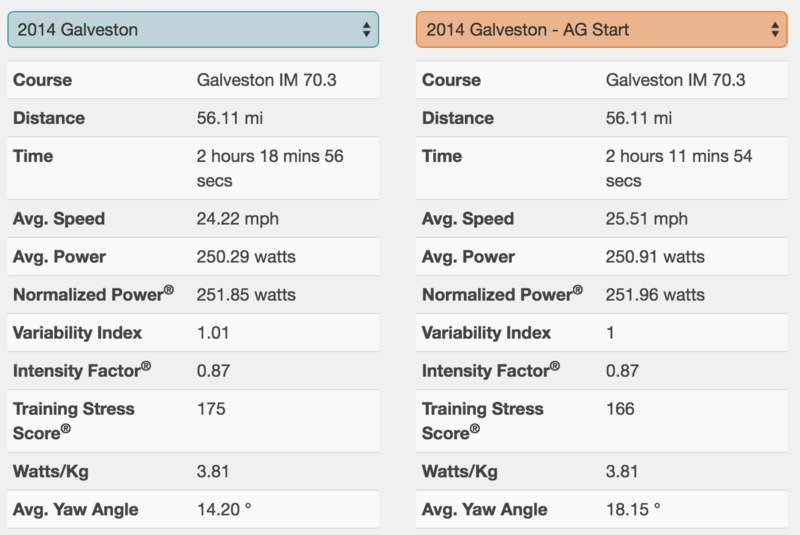 To really highlight the importance and power of the advanced weather feature I want to look back at the 2014 Ironman Texas 70.3 in Galveston. If one was to just look at the results it would appear like a very odd race as many age group athletes ended up having faster bike splits than the pros. Once we dive down into the advanced weather map though the day starts to make much more sense. Galveston is pretty much fully exposed to the wind. While the roads are very good an athlete can really get wind blasted depending on the direction. If we look at the weather conditions the professionals saw we can see that there was a really good tail wind going out and a bit less of a head wind coming back. This made for some quick times, but if we assume an athlete could hold about 250 watts we would expect a time of around 2:19 for this super flat course. In the power profile you can see the big effect the wind has on the return even though it does lighten up a bit. Now lets assume the same athlete started with the Men’s 30-34 Age Group that day. Well for starters the weather profile starts to change pretty significantly. So now the athlete was still experiencing primarily tail wind on the way out, but the wind started shifting to a cross wind on the way back in. Without getting into all the details of why you can go faster with certain crosswinds let's have a look at the results at 250 watts. So this athlete just shaved 7 minutes with no extra power output! Now looking back at the results, with the power of advanced weather knowledge, things start to make much more sense. BBS has had an admittedly tricky time at certain courses especially in longer races where weather can play a major part. Now with advanced weather athletes and coaches can really start to factor changing weather conditions into race day planning. For many races you will not see the estimated split times change significantly but the power pacing strategy will change to incorporate the new advanced weather knowledge. Here are a few advanced weather profiles from Ironman events over the past year. Ouch not much tailwind and a nice big headwind coming back in! Again painful for that last 60 miles! Constant direction but it really starts to pick up as the temp increases. As always we will continue to refine our features and try to provide the most advanced accurate cycling modeling possible. We hope you enjoy Advanced Weather and the new insight it will bring to race planning and execution.